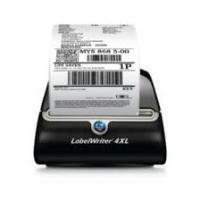 Premium Compatible Label Tapes for the Dymo LabelWriter 4XL printer. The Dymo LabelWriter 4XL label maker is ideal for warehousing and shipping applications. Designed to use with wide-format label applications, this durable label printer delivers high quality and professional labels with self-adhesives. The printer weighs 0.90 kgs and it measures 10.2 x 10 x 10 inches. This modal comes in black and gray housing. At the front, it has a button for adjusting labels and there is a label exit with automatic cutter. It also features a USB port for connectivity purpose. The printer is powered via an adapter. This device can handle over 60 styles, types, and sizes of labels that also include barcodes and shipping labels. This attractive printer comes with an excellent label-printing program for quick and seamless operation. The printer uses thermal printing technology for printing. There are lots of labels to select depending upon the requirement. The Dymo LabelWriter 4XL label printer is an attractive and good option for small businesses. If one needs to print medium number of shipping labels, or other labels up to roughly 4 by 6 inches size, this label printer can easily do the task with the use of Dymo LabelWriter 4XL Label Tapes. Q. What payment methods can I use while ordering the Dymo LabelWriter 4XL label tapes from the site? A. If you order any item from the site, you can pay by using Laser Card, American Express, MasterCard or Visa credit card, Maestro, Switch, Solo or Delta debit card. When you purchase an item on this website the payment will be hosted by Sage Payments in order to ensure maximum security of your credit/debit card details. Q. Is there any way to delete the errors of the previous label? A. Yes, by simply using the back button you can do this. Press it until you reach the start point and then retype and print, just like you do in a Word document. Q. What if I want to print vertically on labels? A. Yes, you can print vertically through the Dymo LabelWriter 4XL label tapes and can use the printer like any other, you just need to set your document to the right size of paper (label) and print the way you want to. Q. How can I connect my LabelWriter printer? A. Before connecting the printer to your computer note that you cannot connect the printer until the software installation is complete. Plug the power cord into the power adapter. Plug the power adapter into the power connector on the bottom of the printer. Plug the other end of the power cord into a power outlet. Plug the USB cable into the USB port on the bottom of the printer. Insert the power and USB cables through the cable channel and set the printer down. When the software is completely installed you can easily connect the other end of the USB cable into an available USB port on your computer. Q. What does the status light indicate about the printer’s life? Solid blue - indicate that the power is on and the printer is ready. Flashing blue - it indicates that the labels are not loaded properly or the Dymo LabelWriter 4XL label tape is in the empty state. Q. How can I clear the Label jams from the printer? Tear off any labels that have already fed through the printer. Press the platen release lever in a forward direction and pull the jammed label out of the platen mechanism. Q. Can I use LabelWriter printer for professional printing? A. Yes, this printer is efficient and print labels in less time, thus good for professional use. Q. Is this a decent printer that has poor reliability? A. No, this printer might issue in paper jams but is more reliable for professional use. All you have to be is very careful while inserting the new Dymo LabelWriter 4XL label tape. Overall it is definitely a worth buy as it is much cheaper, easier and faster than using a regular printer. Q. I am getting lower quality prints while printing through the LabelWriter. How can I improve its poor print quality? A. If the print results are not accurate all you need is to make sure that you are using high-quality Dymo LabelWriter 4XL label tapes for your professional printing because the thermal coating on the labels has different sensitivity other than the good quality labels. Also, if the print quality becomes faint, small dots of white appear scattered through the printed characters, or light and dark patches of printing appear, you are probably using the faulty Dymo LabelWriter 4XL label tapes for printing labels. Try using a different label roll from a fresh box. Another possibility can be that the LabelWriter print head needs cleaning. Every LabelWriter printer comes with a cleaning card. Refer user manual for the directions to use the cleaning card for cleaning the clogged printheads.